Last Friday I got the opportunity to meet with Andy Aparico and Joey Aguilar in a project discussion that we will bring to the public this Fall, organizer of the meeting was Dan Ireland . 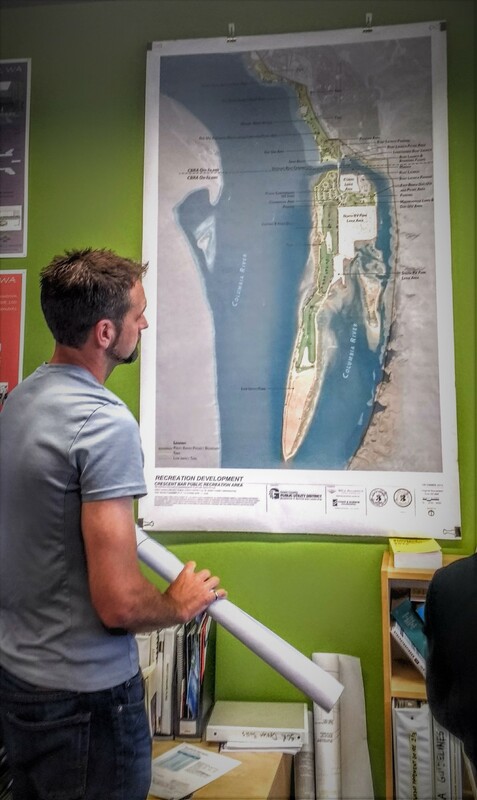 Dan pictured here in this photo, is showing us the redesign of Crescent Bar Area,but while were looking at this project, I had an epiphany (yes, that is spelled correctly) - that the value of eyesight is so undervalued by so many. Last year, I lost my eyesight in one eye, stupid mistake, yet luckily, with surgery, my eyesight got restored this year. A lesson learned from that injury was how valuable eyesight &communication are dependent to each other. So many of us fail to understand this, instead, we talk....and what, 10% of a conversation is remembered? But a visual graphic gives the eyes the ability to see it in three dimension, that along with the talk, really improves the communication. Dan is a person who's day to day is about visuals, and at the end of the day, what visuals feed is the eyes, which if you are lucky enough to have.....need to be fed.